Begum Parveen Sultana (born 1950) is an Assamese Hindustani classical singer of the Patiala Gharana. 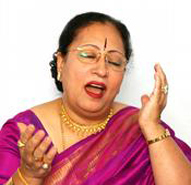 She is among the foremost classical vocalists in India and is known as Queen of Classical Vocal.Shelearnt music under the guidance of late Pandit Chinmoy Lahiri and from 1973, she became a disciple of Ustad Dilshad Khan of the Patiala Gharana.Parveen Sultana gave her first stage performance in 1962 when she was only 12 and has been recording music since 1965.Sultana has sung for movies like Gadar, Kudrat, Do Boond Pani, and Pakeezah. She conferred with numerous awards including Padmashri (1976), Gandharva Kalanidhi, Filmfare best female singer award for the song 'HameTumse Pyar' from Kudrat, Sangeet Natak Academy award.She has performed in thousands of concerts all over the world.